The story begins on what was expected to be a particularly busy day for accounting major Logan Hauer. When all his plans fell through, he texted his friend Josh Paff in an effort to fill the void. Longboarding, an activity the two hold in common, was the solution. 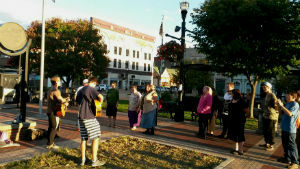 It was also the activity that took them to a town square in Anderson’s city center. 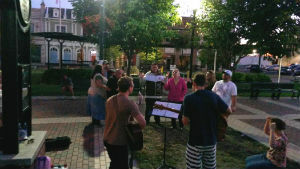 There they encountered a church group playing guitar and worshiping God. While worshiping with the church group, the two learned of a man who had come to hear Logan worship one day. This man had been planning to kill himself that night. Instead, he heard the worship and lifted his eyes to a cross above a downtown church building. He was drawn in by the worship taking place at the town square. Realizing the power of such connections, the two AU sophomores kept coming back, week after week. Josh recalls an experience that was especially meaningful to him—and to a girl who was sitting alone. “I had seen her here the week before,” Josh recounts. “I decided I would just go talk with her. We got into this super-long conversation about life. She’s my age, but she’s been through some of the darkest, most terrifying things you can imagine—stuff that’s happening in our backyard! It disgusted me that people would treat her so poorly. She’s sitting there with a bunch of believers in downtown Anderson. She’s on the fence, but she feels this ‘Jesus thing’ sounds pretty awesome.” Planting seeds for eternal impact, Josh had the incredible experience of praying with her that day. Throwing Frisbees is one way the two create community. “We try to bring Frisbees to engage them,” Logan explains. “They see us having fun, and that we’re approachable.” Same thing holds true when Logan and Josh play guitar and sing. To learn more about Anderson University, visit www.anderson.edu. Were you blessed by reading this story? Support the ongoing work of Church of God Ministries with your gift to the World Ministry Fund at http://www.jesusisthesubject.org/world-ministry-fund/. This entry was posted in All Church of God, Colleges & Universities, Great Lakes and tagged Anderson, Anderson University, community, discipleship, downtown, homeless, Indiana, Josh Paff, Logan Hauer, ministry, outreach, students, urban ministry, worship. Bookmark the permalink.